This program isn’t about creating nice photos. It’s about creating a photography aesthetic that breaks people’s hearts. It’s about getting to shoot the models that were once just faces on your mood boards, and getting to shoot them for your favorite brands. It’s about getting lost in a photography vision until 3am and then sleeping in until whatever time you want the next day. Everyday. Not having to get up and go to a job that doesn’t inspire you. Or waking up early and watching the sun rise with a hot cup of coffee and working on your passion. 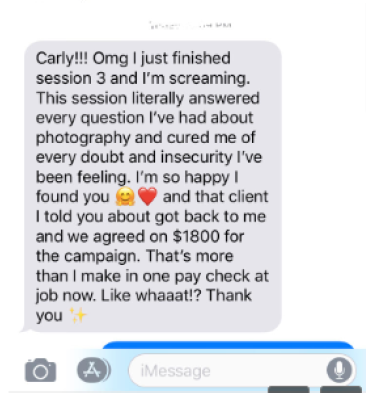 It’s about making more money from one photoshoot than you did in an entire month at your old job. It’s about shedding old, insecure patterns and finding a deep confidence in yourself and your work. It’s about feeling completely free for the first time in your life - financially free, free to hop on a plane whenever you want, free from the pressures of a boss and deadlines, free to pour your heart into photography every day, free to sculpt your own future instead of having someone else do it for you. It’s about doing whatever you want, but doing it with intention, and meeting incredible, magnetic souls along the way that end up becoming lifelong friends. This self-paced course is modelled off of my 1:1 photography mentorship program. I wanted to create a more affordable option for those who still wanted to make changes in their life, but didn’t have a few thousand dollars to spare. I’m tired of there being no relevant, meaningful resources for new photographers. Trust me. I’ve looked. Two years ago I left my career as an accountant to pursue photography full time. I had no connections in the industry, no money, no one to ask questions to. I was totally lost and never knew what my next step should be. I didn’t know one single other photographer who was making a living doing what they loved. All I had was a vision and my $25 film camera from the thrift store. It was scary as hell for the first year but I was tired of people saying it wasn’t possible and I was determined to figure it out for myself. So I did. If you can work through your fears, push yourself and stick with it, the other side is paradise. It’s about changing the entire trajectory of your life so you can look back on it without regrets and live an adventurous, rich life on your own terms. I’m not going to spend time trying to sell you on why you should be a part of this. You’ll know deep down whether this is for you or not. Your old life will always be there waiting for you, so what do you have to lose? Better yet, what do you have to gain? Bringing a professional shoot together - where to find models, where to shoot, hair and makeup? styling? Managing your own time wisely - what should you do all day? Film photography basics - cameras, film, how to get your images online etc. …and many other tips, stories, thoughts, frameworks, templates. 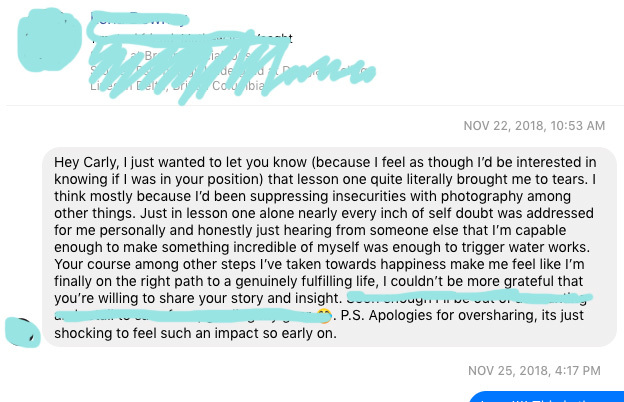 Insight into all the mistakes I’ve made, how I booked certain clients and lost out of others (like a giant department store that wanted me to shoot a campaign including billboards, bus ads, 175 store front displays etc. and how I screwed it up before it even happened) things I wish I did differently, important decisions I made at key points in my career, personal stories about leaving my job, what ended up mattering and what didn’t at all, real examples of emails and pitches I’ve sent, what was going through my head during many moments in my journey. Essentially, things I would have killed to have known when I was starting out that will make things much simpler for you. I know most photographers are scared to give away this type of information. If you’ve ever messaged a photographer asking them a specific question about their work, chances are you’ve been ignored. They don’t like to give away their secrets. But I truly believe that the more people I can empower, the better off our industry will be. There’s room for everyone so I’m laying it all out there for you in this program. Now it’s up to you. If you want to be in this program and you’re willing to work hard, I want you in it. No excuses. Ask yourself if your future is worth $500. Hint: it is, and you’ll made 5x that back on your first paid photoshoot from the content in this course. 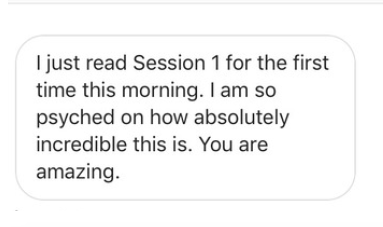 This is the standardized content I deliver in my 1:1 mentorship program that sells out each season at $5000 a person. This program has been split in 10 in-depth workbooks covering 100s of topics. You will receive a new workbook via email every 3 days. Work on them at your own pace, and feel free to email me with questions you have during the program. The program is designed to last 4 weeks, but you’ll have the workbooks to keep forever. Thank you so much for your continued support. It’s because of you that I get to do what I love. This is my way of giving back! I want you to have a program you can pour your heart into over the winter. I want you to feel like you’re actually making progress in your passion and not just spinning your wheels. I want us all to live happier, healthier and with purpose. Scroll down to sign up.